Cinema is storytelling and stories represent our existence, our society and the wide class-divide through its various characters. As a film KAAKA MUTTAI tries to represent the same with a superfine mix of emotions, drama, comedy and a fresh novel idea revolving around two kid boys and their wish to eat a PIZZA at least once in their life in the newly opened local Pizza joint. The so refreshing film has a delightful, heartwarming first hour and an outstanding finale reminding us of all the luxuries we are blessed with, that are not available to the ignored, underprivileged section of our society living with the bare minimum. The project is exceptional not only for its thought provoking, social theme but for the extremely natural performances by both the kids as well as the adults too, along with being a debut film of its writer-director and cinematographer M. Manikandan. And in my humble opinion, this deserves to be rated as one of the most amazing debuts in Indian cinema as a writer, director and cinematographer all together. So naturally performed by both Vignesh and Ramesh as the two kids and Aishwarya Rajesh playing their adorable mother, KAAKA MUTTAI strongly reminds you and falls just short of classic gems such as Majid Majidi’s CHILDREN OF HEAVEN. And that’s because a significant section of the film gets caught in the same clichéd sequences of media hype, political intervention and sensationalism that could have been dealt in a different superior manner. Thankfully the writer director soon moves over it all and comes back with a truly memorable climax that makes you forget all the avoidable shortcomings with a satisfying smile. Here would like to make it clear that this is not any emotionally heavy social drama forcefully showing you the mirror. On the contrary this is so much fun and entertaining to watch including the well-shot and enlightening sequences of the slums, the ones showcasing coal-stealing by the kids, their act of snatching away the mobiles from the trains passing by and a lot more. In fact there is so much to observe and cherish in its various meaningful shots and background that one would love to watch a few specific sequences again, especially to notice the way director makes the two talented kids emote together in an unbelievably natural way. Having said that, would also like to strongly mention that though KAAKA MUTTAI deservingly won two NATIONAL AWARDS for The Best Children’s Film and The Best Child Artist (for both Ramesh and Vignesh), it ideally shouldn’t be categorized as just a Children’s film. To be honest this is much more in terms of theme, content and message as a never before kind of attempt that it would be an insult to simply call it a children’s film. As a matter of fact, this is a must watch film for all adults making them realize about LIFE, that is ironically lived more joyfully in the LESS in comparison to the MORE. And that is a truth, which has been later realized by many in their last years of their life (mentioned in their memoirs and biographies). In the technical departments, KAAKA MUTTAI is beautifully supported by a praiseworthy cinematography, brilliant art direction, soothing background score and fine music adding a lot into its overall impact conveying a socially relevant message. 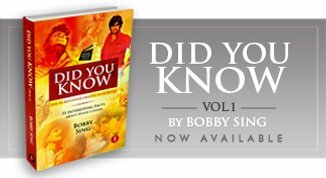 But if you still are not convinced then just take a note of its title meaning “The Crow's Egg”, which actually points towards the life where the kids cannot afford to have the normal eggs in their meals and thus go for the crow’s egg on the trees as their only resort. The film was later remade in Marathi titled HALF TICKET directed by Samit Kakkad, but the original is the one I would strongly recommend to all reader friends of BTC. 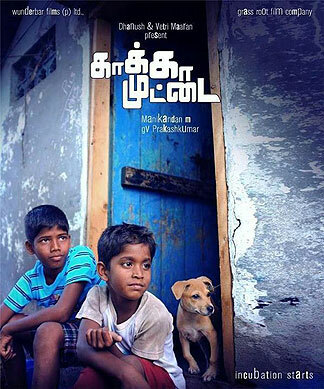 Tags : KAAKA MUTTAI (Tamil) Review by Bobby Sing at bobbytalkscinema.com, Must Watch Indian Regional Language Gems, Not to be missed Indian Regional Language Films.